Tanks have come a long way since the first one was developed 100 years ago. That vehicle, which can still be seen at the Tank Museum in Bovington, Dorset, was little more than a thin-walled steel box on tracks, in contrast to today’s tanks, which are highly sophisticated weapon systems that form the basis of mechanised ground warfare. An outstanding feature of the development of tanks is the installation of progressively more powerful armament. In the late 1930s, tanks were typically armed with 37 mm to 47 mm guns—no larger in calibre than the cannon of today’s infantry fighting vehicles. During the Second World War, tanks were armed with 75 mm or 76 mm guns. During the Cold War that followed, Soviet T-54 and T-55 tanks, as well as Chinese Type 59 tanks, were armed with larger calibre, 100 mm guns, while most Western tanks were armed with 105 mm guns. Further increases in calibre emerged in the 1960s with the British Chieftain tank, which had a 120 mm gun, and the Soviet T-62 and T-64 tanks, which had 115 mm and 125 mm guns, respectively. For the first time, the guns of both Soviet tanks had smooth bores and fired Armour Piercing, Fin Stabilised, Discarding Sabot (APFSDS) projectiles with arrow-like penetrators that could defeat thicker armour than earlier types of armour-piercing ammunition. Subsequently, all Soviet, and later Chinese tanks, were armed with 125 mm smooth bore guns, while in the West, tanks were fitted with 120 mm smooth-bore guns, starting with the German Leopard 2. Similarly, 120 mm Rheinmetall guns were subsequently adopted for the US M1A1 Abrams and the Israeli Merkava Mark 3, as well as the Italian C1 Ariete battle tank, the Japanese Type 50 and the South Korean K1A1. A similar smooth-bore gun was also adopted for the French Leclerc, and more recently, guns of the 120 mm Rheinmetall-type were adopted for the Japanese Type 10 and South Korean K-2, which are currently in production, and for the Altay battle tank, which is being developed for the Turkish Army. The only recently produced tanks with 120 mm rifled guns are the British Challenger 2 and the Indian Arjun. The use of even larger calibre guns was considered in the 1960s when a 152 mm gun-missile launcher was mounted on the US–German MBT-70, but it was abandoned by the end of the decade with the rest of this experimental tank. A similar fate overtook the FV215 designed in Britain in 1950, which was to be armed with an even larger calibre 183 mm gun. The tank was never built, but the 183 mm gun was made and test fired from a Centurion tank chassis; it remains to this day the world’s largest calibre tank gun. No increase in calibre beyond 120 mm was considered until the 1980s when work began in the United States, Britain, France and Germany on 140 mm tank guns. However, what became a quadripartite development programme was terminated in the 1990s when120 mm guns came to be regarded as sufficiently powerful to deal with hostile tanks. A similar conclusion may have been reached by the Russian Army which, having experimented in the 1990s with 152 mm tank guns, mounted a 125 mm gun in the pre-production versions of its new T-14 Armata tank paraded for the first time last year in Moscow. Liquid propellants and electromagnetic guns. The problems of handling increasingly large calibre tank gun ammunition led, soon after the Second World War, to exploratory work on liquid-propellant (LP) guns, which offered, in principle, the advantage of the propellant being pumped directly into the guns. The possibility of doing this was pursued in the United States and Britain from the 1950s to the 1980s, but work on LP guns was terminated in the 1990s and there appears to be no further interest in them. Another potential alternative to solid-propellant tank guns emerged in the 1980s when experiments began in the United States, which offered the prospect of electromagnetic (EM) guns that launched projectiles with very high velocities. 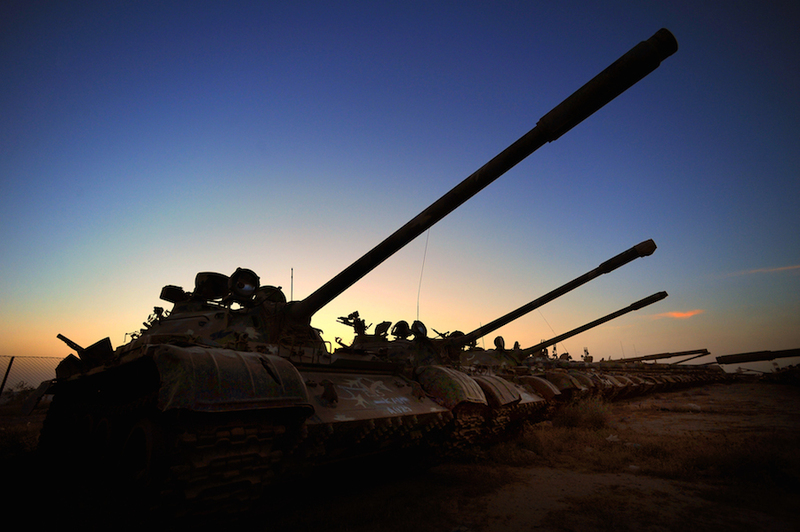 Progress initially achieved led to optimistic predictions that tanks with EM guns would become viable during the 1990s and, according to some military authorities, would be fielded by 2012. In fact, electrical energy generating equipment required by EM guns continued to be far too large and heavy for installation in tanks. Consequently, although there are still occasional proposals for the use of EM guns in tanks, interest in them has shifted to naval applications where weight and size constraints are less severe. In 2005, their development was taken up by the US Navy and a BlitzerEM rail gun is now being developed by General Atomics. Electrothermal-chemical, or ETC, guns which appeared soon after EM guns, had a better chance of being used in tanks because only a part of the energy required to launch their projectiles was electrical, the rest came from the chemical reaction of a propellant. Their electrical equipment is lighter and smaller than that of the EM guns and they looked promising at first; as long ago as 1989, firing trials were conducted in the United States of 120 mm ETC guns with the view of rearming M1 tanks with them. The trials proved a failure, but work on ETC guns continued in Germany as well as the United States and 120 mm ETC guns have come to be considered as potential alternatives to 140 mm solid propellant guns. “To survive the threat of increasingly powerful weapons, tanks have had to improve their level of protection. For the first 50 years of their existence, they relied on solid-steel armour, which grew gradually in thickness from as little as 6 mm to 200 mm. Further increases were not practical as they would have caused unacceptable increases in the weight of tanks and compromised their mobility. As it is, the weight of some tanks, such as the British Challenger 2, US M2A2 and German Leopard 2A6, has already reached 62, or even 74 tonnes." Moreover, solid steel armour proved relatively ineffective, in relation to its weight, against shaped charge weapons, and in particular against anti-tank guided missiles which came into use in the 1960s. This led to the development of new types of spaced, multi-plate armour incorporating non-metallic materials, which proved much more effective against shaped charges in relation to their weight than steel armour. 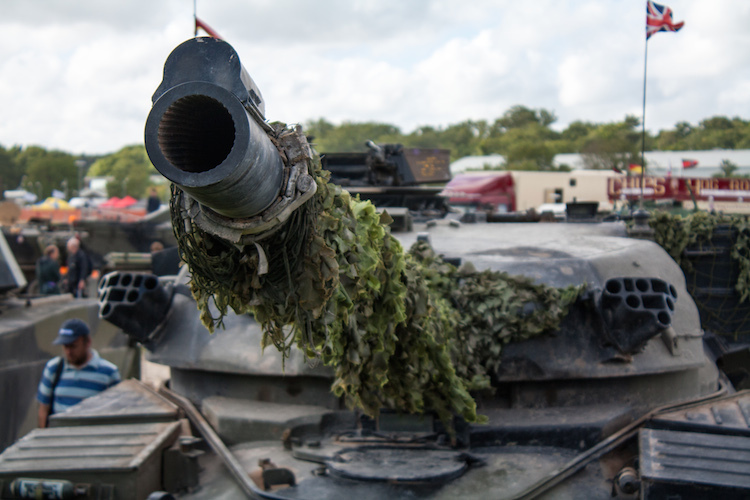 The best known of them was developed in Britain in the 1960s and was initially adopted in the 1970s for the US M1, and later for the British Challenger 1. Originally called Burlington armour, it became more widely known as Chobham armour, which is still considered secret in spite of the capture of several M1A1 tanks by ISIL (Daesh) after the collapse of the US-equipped Iraqi Army two years ago. An even more effective form of protection against shaped charges, namely explosive reactive armour, or ERA, appeared for the first time in 1982 on Israeli tanks. It was widely adopted soon afterwards on Soviet tanks and has become a standard feature on Russian as well as Chinese tanks. However, it suffers from the disadvantage of being liable to cause collateral damage, particularly in urban operations, which has tended to limit its use. The latest form of defence, Active Protection Systems, appeared originally in 1983 on Soviet T-55AD tanks and was used during the Soviet occupation of Afghanistan. The only other APS to have been used in action so far is the the Israeli Trophy system, mounted on Merkava Mark 4 tanks since 2007. This system was used successfully during fighting in the Gaza Strip two years ago when it protected Merkavas against Russian-made Kornet anti-tank guided missiles, as well as RPG-29 rocket-propelled grenades with tandem warheads used by Hamas militants. Several active protection systems have also been developed in countries other than Israel and although they have yet to be put to the test, there can be no doubt that the use of these systems will be essential for tanks’ survival. For all the advances in the protection of tanks as well as their armament, the configuration of most tanks has remained unchanged, in principle, from that introduced as long ago as 1918 by the French Renault FT light tank. This included a driver’s station at the front of the hull, a manned rotating turret mounting the tank’s armament over the centre of it, and an engine and transmission compartment at the rear. During the Second World War, most tanks were provided with an additional weapon station in the form of a machine gun mounted in front of the hull and operated by a gunner sitting next to the driver. This meant that tanks came to have five-man crews as their turrets were manned by three men, which included a loader, as well as a commander and a gunner, who became essential as the calibre of tank guns increased to 75 mm or 76 mm and beyond. Tanks introduced after the war, like the British Centurion and the Soviet T-54, dispensed with the hull machine gunner who came to be regarded as taking up an undue amount of space. Crews were reduced to four men, which became the norm for tanks designed in the West in the 1950s and 1960s, or even later, such as the US M60, British Chieftain, German Leopard 1, French AMX-30, Swiss Panzer 61, Japanese Type 74 and the South Korean K-1. This configuration applies also to the principal tanks currently used in the West, namely the US M1A1, the German Leopard 2, the Israeli Merkava and the British Challenger 2, and even to the Arjun being produced in India and the Altay being developed in Turkey. However, in the 1960s, the Soviet Army began to develop T-64 and then T-72 tanks with automatic loading systems for their 125 mm guns, which eliminated the need for a human loader and enabled crews to be reduced to three men. Similarly, carousel-type automatic loading systems located under the turrets were subsequently incorporated in other Soviet tanks, including the T-90S produced for India, and in Chinese tanks. The latter include the MBT-2000 exported to Bangladesh, which shows that even developing countries now operate tanks with automatically loaded guns. Elsewhere, except for the French AMX-13 light tank of the 1950s, which had an oscillating turret and the turret-less Swedish S-tank of the 1960s, automatic loading was not used until 1990 when the Japanese Type 90 and the French Leclerc were introduced with autoloaders in the turret bustles. The only other tanks with similar autoloaders and three-man crews to be produced since then are the Japanese Type 10 and the South Korean K-2. There might have been others had there been further development of 140 mm tank guns because their large and heavy ammunition no longer made manual loading practicable. The advent of automatic loading opened the possibility of operating tank guns by remote control and, consequently, relocating three-man crews in the hull where they could be better protected. The possibility of doing this was explored by the United States as long ago as 1981with an M1 tank modified into the so-called Tank Test Bed, which incorporated a remotely operated 120 mm gun in an unmanned turret. The Russian Army also put three crewmen in the hull to test the experimental T-95 tank designed in the 1990s, but they abandoned it in 2010. However, Russia adopted a configuration similar to that of the T-95 for its new T-14 Armata, which is the first tank to be produced with an unmanned, remotely controlled turret and a three-man crew in the hull. A further reduction in the crew located in the hull to two men was also proposed and tested in an experimental EGS (Experimentalträger Gesamtschutz) tank built in Germany in the 1990s. What is more, such a reduction was actually incorporated in the XM1202 Mounted Combat System armed with a 120 mm gun in an unmanned turret, which was developed as the “tank equivalent,” part of the much vaunted US Future Combat Systems. The latter was intended to lead to strategically mobile mechanised forces, but their development was abandoned in 2009 as impracticable. It remains an open question as to whether two crewmen could successfully perform, for any length of time, the three distinct functions of a tank crew, namely tactical command, weapon system operation and driving or navigation. In the meantime, tanks continue to be mobile, protected platforms, which make the weapons mounted on them more effective. As such they remain an important component of ground forces. Richard Ogorkiewicz is a graduate in mechanical engineering from London University and a Fellow of the Institution of Mechanical Engineers. Until recently he was a visiting professor at the Defence Academy of the United Kingdom, where for the past 25 years he has lectured on various aspects of armoured fighting vehicle technology. For more than 30 years he was an independent member of the Defence Scientific Advisory Council of the Ministry of Defence and a consultant on armoured vehicles to industrial and government organisations in the UK, the US, Brazil, Italy, South Korea and Turkey. He is also consulting editor of IHS Jane’s International Defence Review and a trustee of the national Tank Museum at Bovington.